ME AND OPHELIA is the personal blog of Ingrid Jones living by the sea in Dorset, England, United Kingdom. Since October 1999, I have been chronically ill with a severe form of myalgic encephalomyelitis, also known as ME or chronic fatigue syndrome. Here I communicate with my friends, ME comrades and online pals - people of all ages, from all walks of life. Sharing news in general and of my life with Ophelia and ME, good food and household management, home user technology and business services and how all these things impact on my 'lifestyle management programme'. I am the same age as our Prime Minister Tony Blair (a good example of a 50-year-old these days, still full of ambition and vitality!) and my many interests include Arts and Crafts antiques, modern studio pottery, cookery and collecting simple recipes for fresh organic produce. 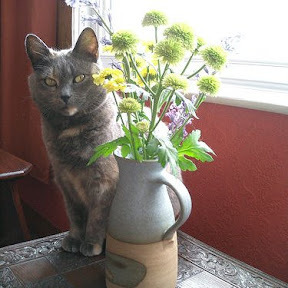 OPHELIA is my wonderful British Blue/Burmese/Ginger Brindle Tortie (a moggie in vet speak) with big ears, short legs, golden eyes and fur as soft as mink. ME AND OPHELIA are constant companions living side by side in this new adventure onto the Internet and charting the road to recovery. Any friendly feedback, tips or comments would be gratefully received. Evidenced by muscle pain, with inflammation of the brain and spinal cord, ME has been known for half a century as a-typical polio. The symptoms of extreme lassitude, and the swift onset of exhaustion that characterise the disease, also caused it to be known for many years as chronic fatigue syndrome or CFS. It was only classified by the World Health Organisation of the United Nations as a neurological disorder in 1969. The disorder is triggered by a virus infection that occurs worldwide in epidemic and pandemic form: seasonally and in selected geographical areas. It affects about 1% of the British population and there is no known cure. While three-quarters of those who become infected do not present advanced symptoms, 25% of ME sufferers are chronically affected with severe illness and pain, causing them to become profoundly disabled and very largely housebound. The condition can last throughout life without remission of any kind. Doctors and sufferers generally agree that the worst effects of the disease can be ".............managed by strict adherence to conservation of energy, reduction of stress and simplification of work: augmented by education, with practical and economic support".